There are only two ways that the diplomatic rift between the U.S. and Turkey can end: a compromise that salvages the relationship as best possible, or a complete rupture with devastating consequences both for Turkey's economy and America's regional strategic interests. Either way, there is no going back to the way things were. The arrest in Turkey of American pastor Andrew Brunson nearly two years ago has led to a diplomatic spat that threatens a full-blown economic meltdown in Turkey. Brunson, along with many foreign nationals that were detained in the wake of the failed 2016 coup attempt, has been accused of "supporting terrorism." A deal for Brunson's release seemed likely as Turkish officials traveled to Washington this week, but fell apart apparently over last-minute Turkish demands. Meanwhile, tensions have ratcheted up. The Trump administration has imposed sanctions on Turkey's interior and justice ministers. Erdogan threatened retaliation and got the support of most of the Turkish opposition. On Wednesday, Stars and Stripes reported that a group of pro-government lawyers in Turkey have filed charges against several U.S. officers at the Incirlik Air Base, accusing them too of ties to terrorist groups. They are demanding all flights leaving the base be temporarily suspended and a search warrant be executed. The standoff is partly the accumulation of years of resentment, despite the pretenses of a faithful partnership. Turkey's once-unassailable support among U.S. foreign policy leaders, and in Congress, has been weakened by years of authoritarian creep, a worsening human rights record and cooperation with Russia and Iran in Syria. Turkey's plans for a $2 billion purchase of Russian-made S-400 surface-to-air missiles, which NATO has said are incompatible with allied systems and restrictions on American use of the Incirlik Air Base, haven't gone down well. The Turkish leader is also furious at American support for the Kurdish militia fighting Islamic State in northern Syria. Earlier this year, he threatened American troops with an "Ottoman slap" if the U.S. tried to block Turkey's military incursion into northwest Syria. One major source of contention has been the U.S. refusal to turn over the Pennsylvania-based cleric Fethullah Gulen, a one-time Erdogan ally and now an enemy, whom Erdogan alleges was behind the coup and other attempts to undermine him. Trump's abandonment of the Iran nuclear deal is another sore point; nearly half of Turkey's oil imports come from Iran, and the re-imposition of sanctions against Iran hurts Turkey's economy. But "impossible to ignore" is not to say that the Trump administration has become a principled defender of human rights in Turkey. Far from it. Trump, whose name adorns luxury properties in Turkey, expressed only praise for Erdogan when they met in 2017. When Erdogan's supporters and guards attacked protesters in Washington, the affair was handled quietly. The administration has been silent on other arrests of U.S. and foreign nationals in Turkey. But it was ready to strike a deal for Brunson's release. The U.S. had already asked Israel to release Ebru Ozkan, a Turkish national who was arrested there on suspicion of aiding Hamas (Israel deported her the day after Trump called Israeli President Benjamin Netanyahu). The Trump administration was also reportedly ready to allow Hakan Atilla, a former top executive of state-owned Halkbank, convicted for violating Iran sanctions, to serve out the rest of his prison sentence in Turkey. The deal was scuppered, reportedly, when Turkey wanted relief on a multibillion-dollar fine against Halkbank and an assurance that any investigations be dropped. The U.S. can afford to play a longer game. The June 24 election may have strengthened Erdogan's power further, but he didn't win by a Putin-sized margin. (Erdogan cleared just over 52 percent, and that's if we all agree to ignore the voting irregularities that presumably bolstered his numbers.) Turkey is divided politically, and the longer Erdogan rules by coercion, the more vulnerable he may become, especially if Turkey's economy continues to suffer. As the main barometer of confidence in the country, the lira's decline speaks volumes. Even so, a diplomatic solution is clearly preferable to continued escalation. Erdogan is sacrificing the Turkish economy in order to keep Brunson as a bargaining chit. A fractured relationship with the U.S. will also put a strain on Turkey's EU relationships and will give investors, already spooked, even more pause. 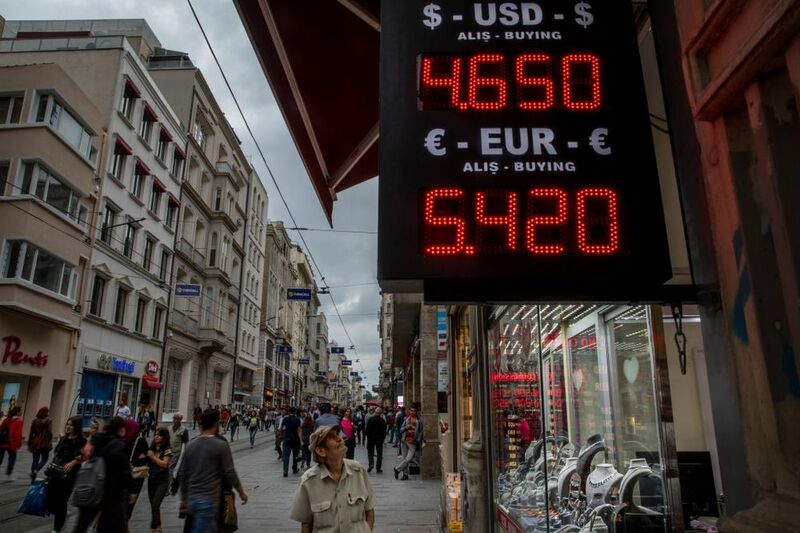 Turkey’s unfolding economic crisis has deepened further after Donald Trump announced a doubling of US import tariffs on Turkish steel and aluminium, deepening the country’s currency freefall and rattling financial markets. The Turkish lira plunged by more than 17% against the dollar after the president announced the move, amid a widening dispute between Washington and Ankara over the imprisonment of the US pastor Andrew Brunson. Erdogan wants to play Sultan. Instead he is ruining his country. Trump is doing Erdogan a favor, he can now blame US imperialism for the inevitable crash. Turkey being put in their place is a good thing. Erdogan is out of his mind.